Where does spam come from? Why do people send it? And what can we do to stop it clogging up our inboxes? This two-part article explores these issues and comes up with practical ideas for keeping us safe, secure and spam-free. It’s almost impossible to open your e-mail inbox and to not see spam in there. In some cases, it’s because someone unintentionally for signed up to things like clickbait articles. A clickbait article is, for instance, an article where they promise you a free trip to New York – although the free trip may not even exist. Most of the time those articles channel responses to information harvesters which, in turn, will lead to databases containing literally millions of email addresses and personal contact details. Such databases or lists can be sold to the highest bidder on the dark net/dark web/deep web, or even on normal sites. By the way, this is just one of the ways email addresses are gathered. Hackers might also hack into a company directly and steal its customer details. Not every website where you need to leave your details will sell them to the highest bidder. But sometimes the old rings true: If it looks too good to be true, it probably is. Be smart and know where you leave your details. A lot of companies – both good and bad – carry out datamining. Google keeps records of where you have visited in order to make your next search a faster and more pleasant experience; Microsoft collects data about the errors you encounter and about user behavior in general as well. A more notorious data collector is Facebook though: Each click you make on the apparently interesting articles you see on its site earns them money. But for all these big companies, there are legions of individuals out there aiming to betray your trust. Everybody can make a site, no corporate license is needed, and this is what makes the internet great. But the anonymity can also lead to these people harvesting your details to sell to the highest bidder. But enough about how e-mail addresses are harvested. Let’s move on to actual spam e-mails. Also known as junk mail or unsolicited bulk email, spam emails make up a huge proportion all electronic mails sent over the world wide web. But in contrast to your normal email these ones are sent to you without your consent. Sometimes they only wish to sell you something, like cheap Viagra. In other cases, they lead to phishing sites or malware to infect your computer. Spam-runs target millions and millions of email accounts in one go and, although most of these emails go straight to users’ junk folders, many still reach the intended mailbox. While most of us delete them some people will unwisely open them and actually click on the links they offer. However small this group of unwise clickers may be, they are the actual targets of the spammers. After all, a spammer’s overhead cost is very low: any server can send e-mails and even very cheap VPS servers can do the job so setting up a bulk email operation is relatively cheap and easy. In fact there’s evidence to suggest that it costs a spammer only $0,000010 per e-mail to be sent. 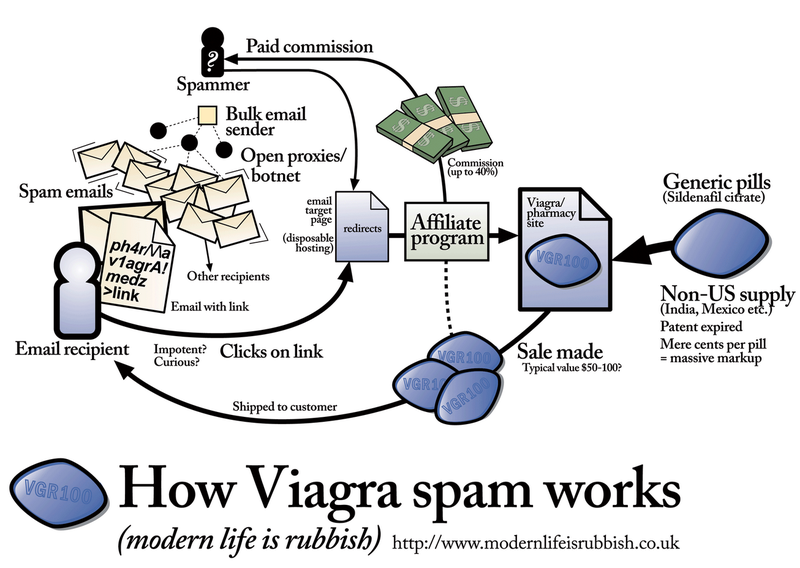 The picture below (courtesy of www.modernliferubbish.co.uk) shows how the spammers make their money – and lots of it – by converting these people’s clicks into cash. In the next blog I will explain how to ensure your advertised e-mails are legal and how to secure your server so it cannot be used for spam runs.